Prepare the tempura batte as recipe directs. Place the batter in the freezer for 10 to 15 minutes. Cold batter results in crispier tempura. Heat the oil in a heavy deep frying pot. When the oil is hot, dip 5 to 7 pieces of vegetables into the batter completely coating them. Place the batter coated vegetables into the hot oil and deep fry until golden and crispy on each side. Make sure not to deep fry too many pieces at one time, as this lowers the temperature of the oil and results in soggy tempura. Remove with a slotted spoon or oil skimmer and drain on paper towels. Take a sushi mat, set it on the counter or cutting board. Place a sheet of sushi nori on the mat with the rough, dull side facing up. Take 1 to 1 1/4 cups of cooked sushi rice and spread it evenly on the bottom half of the sheet of nori. Moisten a wooden spoon or rice paddle and press down firmly on the rice to evenly spread and cover half the sheet of nori. 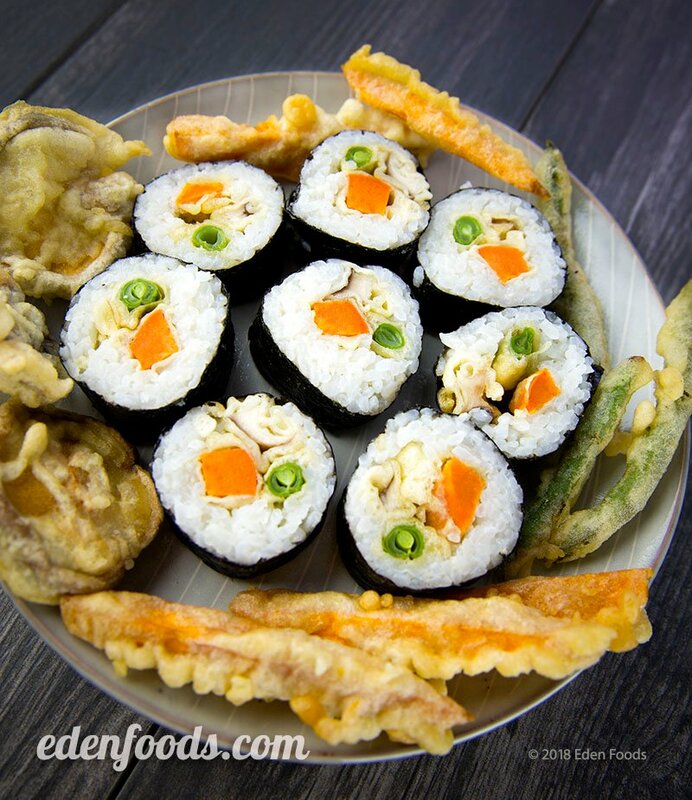 Place several slices of various tempura vegetables lengthwise across the bottom half of the rice. Pull the mat up with your thumbs, hold and tuck the fillings with all eight fingers. Roll forward in a jelly roll fashion, and tuck the nori forward, while pulling back the mat slightly each time you roll forward. Just before you reach the end of the sheet of nori, moisten the end with a little cold water. Continue rolling until you have a cylinder shaped roll. Tightly wrap the bamboo mat around the roll, and squeeze gently to seal the nori roll. Remove the mat and place the roll on the cutting board. Moisten a sharp knife with water and cut the roll in half. Cut each half in half, then each quarter in half, moistening the knife lightly each time before cutting. You should now have eight equal size pieces of sushi. Repeat the above steps until you have 4 rolls; 32 pieces of sushi. Serve with a dip sauce of 50% Eden Shoyu Soy Sauce and 50% cold water with finely grated ginger or grated daikon mixed in. Dip the sushi into the sauce before eating each slice.